The Arkon Friction Dashboard Mount weighs in at roughly 1.5 pounds, is black in color and measures 8 x 7 inches. These mounts are made to work in conjunction with your suction cup mount. The photo to the left features the Arkon friction mount with a suction cup attached that has a cradle for a Garmin Nuvi 200. When you purchase the Arkon mount, the suction cup mount is not included, that was added by me for the photo. The mount features an attached 80mm smooth round plastic plate which is a bit larger than the diameter of most suction cup mounts. You will attach your suction cup mount to the center plate just like it was your windshield. Most suction mounts made these days feature a vacuum locking base so be sure that lever is flipped down for a firm attachment. The Arkon mount features an open front. The open front is a nice to have especially if your suction mount is short or if you plan to drape a cable over the front with the intent of plugging into your vehicle’s power socket. Like other friction dashboard mounts on the market, the bottom is covered by a rubber coating which minimizes movement when on the dash. Dashboards that have significant downward slopes and those that have been oiled will affect the friction feature of this mount. A feature that is unique to the Arkon Friction Dashboard Mount is the inclusion of a safety anchor. The safety anchor has an adhesive bottom and can be placed on your dashboard. The mount itself has a small loop attached to the back of it which allows you to attach it to the adhesive safety anchor. This is a nice added feature that improves the stability of the mount during a sudden stop. The safety anchor is very small in size and is hardly noticed. Removal of the mount when using the safety anchor is simply a matter of slipping the loop on the mount off the safety anchor hook. The bottom of the mount is somewhat rigid versus other weighted friction mounts on the market. While this probably will not cause an issue, if your dashboard has a lot curves built into it, you may be challenged to get this mount to sit flat and should consider a beanbag mount that is made somewhat more flexible than the Arkon Friction Dashboard Mount. This is a universal mount. It works with practically all brands of suction cup mounts. Although it has been targeted in the past towards GPS users, these also make excellent additions to a cell phone mount of even one that is used for a small tablet. 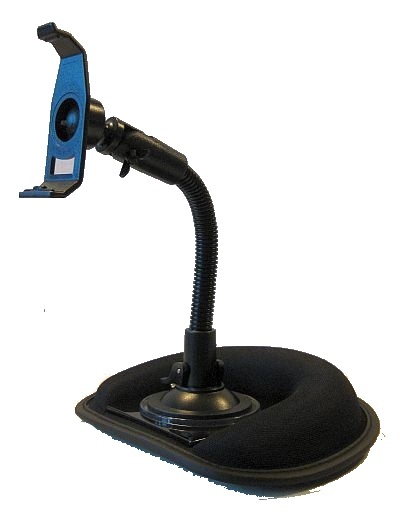 The Arkon Friction Dashboard Mount can also be used for mounting an aftermarket satellite radio. There are a few other manufacturers of weighted friction mounts. We recently reviewed the mother of all dashboard mounts, the Garmin 010-10908-00 Bean Bag Mount which you can read here. The difference between these two mounts aren’t trivial. We prefer the The Arkon Friction Dashboard Mount to the Garmin entry. While both are well made, the Arkon entry includes the safety anchor feature and is universal. The Garmin mount is not universal and the base cannot be used with a suction cup mount.